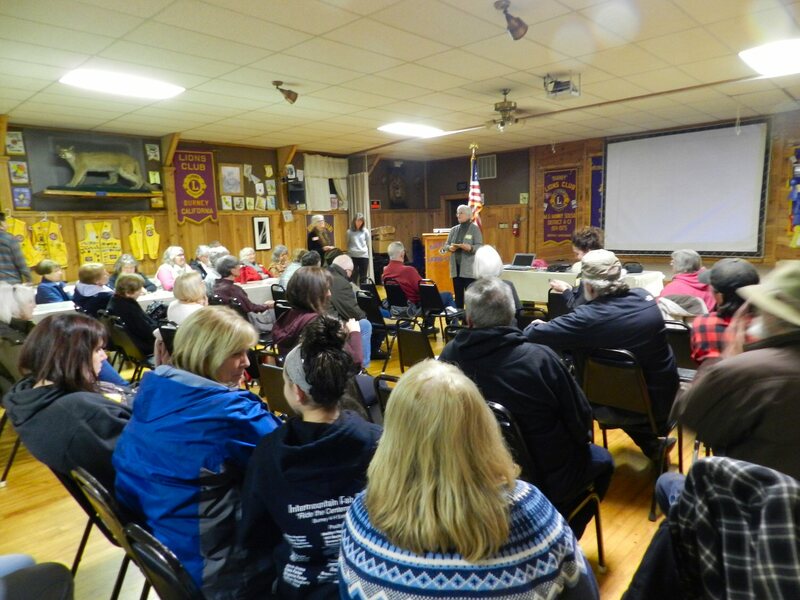 On Tuesday evening January 22 at the Burney Lions Hall, the Friends of the Intermountain Library (FOIL) held a meeting to update the Burney community on the status of efforts to acquire a new building for the Intermountain branch of the Shasta County Library system in Burney. About 50 community members attended the event. FOIL president Pat Pell moderated the meeting. 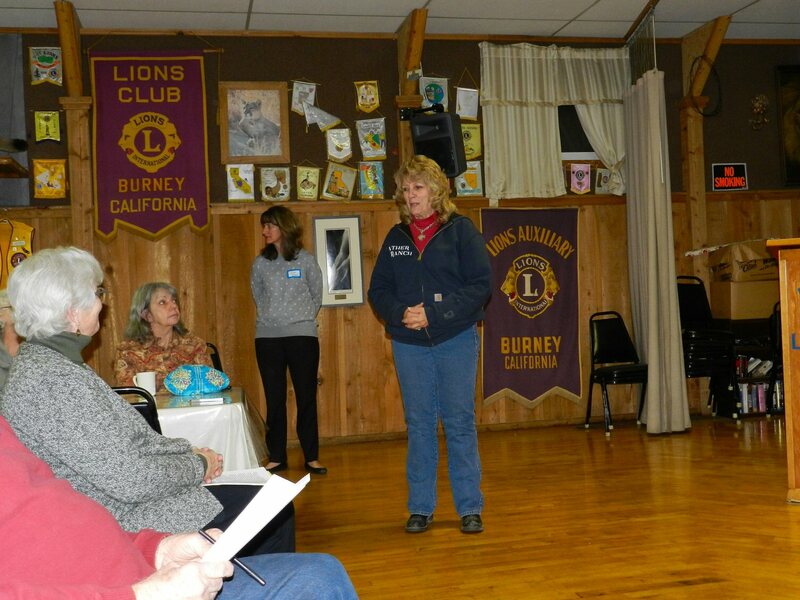 Ms. Pell thanked Lions Club President Mike Barnes for hosting the meeting on short notice and thanked the Burney Lions and the Rotary Club for their support for the project. Pell then welcomed several people who have been helping prepare the FOIL plan. Kim Niemer, the evening’s main presenter, is the Redding Community Services Director. In that capacity, she helps to oversee the governance of the Shasta County Library System. Francie Sullivan is currently a Shasta County Library Advisory Board representative. She lived in Burney and has served on the Shasta County Board of Supervisors and was on the Redding City Council from 2010 to 2018. Peggy O’Lea is the retired director of the Shasta Library Foundation who helped to organize community support for the new Redding Library. Anna M. Tracy is the Library Director for the Shasta Public Libraries who has been coming to Burney once a month to work with the Burney Library. Ms. Pell also introduced the current officers and members of the FOIL Board and Kevin McKay, a general contractor from Cassel who has helped FOIL work through some of the practical aspects of improvements that are necessary for the proposed building. Before Ms. Niemer’s presentation of FOIL’s action plan, Shasta County Supervisor Mary Rickert made brief comments. Rickert said that she came as an observer, explaining that she could not take a position on the proposed library building because she needs to remain open to all points of view until the public hearing has taken place at the Board of Supervisors and a vote is taken. She also said that she needs to be careful to abide by the Brown Act. After Supervisor Rickert’s remarks, Pell invited Ms. Niemer to speak. Ms. Niemer gave a 25 minute power point presentation in which she explained some of the history of the library and FOIL’s action plan for completion of the building project. 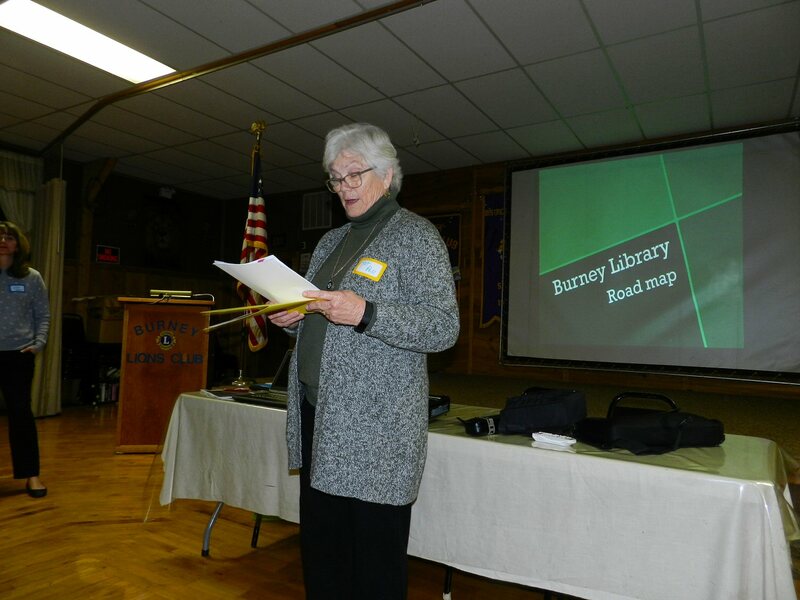 Ms. Niemer’s presentation began with a timeline of the history of the Burney Library in the context of the Shasta County Library system. The Burney Library became Shasta County’s first branch library in 1949. The current library building was built in 1969. In 1989, all 14 of the Shasta County Library branches were closed due to a funding crisis. FOIL was formed to combat funding issues. In 1990, Shasta County along with the Cities of Redding and Anderson agreed to fund and reopen three libraries as part of the Shasta County Library system: Redding, Anderson, and Burney. FOIL has been making annual contributions as a part of the agreement. In 1999, FOIL’s contributions increased to over $11,000 per year. In 2003, the State of California awarded a $12 million grant for the building of a new Redding library. FOIL continued to financially support the library system. In 2004, another funding crisis led to shortened library hours. A Library Governance and Financing Task Force was formed to evaluate library services. FOIL continued their support during the hour shortage. In 2005, the task force recommended transferring governance to the City of Redding and in 2006, the Shasta County Board of Supervisors entered a 40 year contract with the City of Redding to manage County Library Services. That same year, the Redding City Council hired Library Systems and Services LLC to manage the library system. The arrangement has proved efficient and cost effective. The new Redding Library opened in 2007. In 2008, Shasta County entered a community benefit agreement with the Hatchet Ridge Wind LLC. Hatchet Ridge Wind provided a grant of $1 million and an additional $100,000 per year for 20 years. The payments are to be used for the benefit of Burney and the surrounding area. In 2009, FOIL made the expansion and relocation of the Burney Branch Library a priority. In 2012, Shasta County agreed to a preliminary feasibility study for a new library building. The study was completed in 2013. In 2014, the study was presented to the Board of Supervisors and the Board approved and set aside a $400,000 grant for a new library building contingent upon the formulation of a feasible plan and successful fundraising by FOIL. After FOIL determined that the best location for a new building was the Roper building on Main Street, Shasta County did an assessment of the Roper building in 2016. In 2018, an official appraisal of the building was completed. The appraisal came in at $285,000. There is a difference between the appraised value and the assessment of the building by the County. The County maintains that the value of the property is $300,000, which is the price that Mr. Roper is asking for the building. There are ongoing discussions on how to bridge the gap. Ms. Niemar explained that the project is nearing the finish line. FOIL is hoping to bring their proposed plan before the Board of Supervisors in February for consideration as an action item. Their plan involves shared responsibility amongst Shasta County, The City of Redding, and FOIL. FOIL is hoping that the plan will be accepted and that the County will approve release of the $400,000 Windmill funds for the purchase of the building and installation of a visual fire alarm system. FOIL would need to complete their fundraising. According Ms. Pell, FOIL has $50,000 in cash and an additional $50,000 in pledges. Several foundations have indicated that they would also provide grants once a building is secured. They would be responsible for completing interior ADA improvements, parking lot improvements and moving the contents of the library to the new location. The City of Redding would coordinate with the County on implementation of the action plan. Ms. Niemer proposed that he City of Redding would complete the parking lot improvements in coordination with FOIL and partner with FOIL on relocation and start-up. She then invited Francie Sullivan and Peggy O’Lea to come forward to share. Both advised everyone to write or Email all of the members of the Board of Supervisors to encourage them to support the project. There are five Supervisors on the Shasta County Board of Supervisors. In order for the project to be approved, three Board Members of the Board will need to vote in favor of the plan. Ms. Sullivan also stressed the advantages that the County Library system provides and the difference between the County Library system and local lending libraries. The discussion led to an extended period of question and answer during which Niemer, Sullivan, O’Lea, and Anna Tracy explained in more detail the plans and functions of the library. A copy of the power point presentation on the action plan is available at the Burney Library. People desiring more information about the plan, proposed library services, or how they can help, please contact Pat Pell, FOIL President, 335-7236 or ppell389@gmail.com.